Hi, I am interested in your 1992 Cadillac Allante (stock #0802-NSH) listed on Autotrader for $7,995. I'd like to get more information about this vehicle and confirm its availability. The right color; the right features; and the right price. 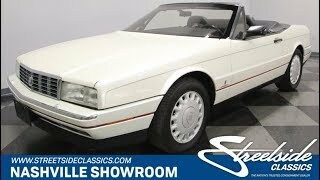 This 1992 Cadillac Allante delivers a modern luxury experience in a package that is guaranteed to turn heads. You can tell this is a well-maintained car from the moment it comes into view. The factory Pearl White paint has a nice soft but deep glow that makes sure it radiates the moment any light hits the finish. So youll have an instant feeling of pride every time this car comes back from the valet stand. Of course, its more than just the paint that makes this one great. The Pininfarina-designed and built body still has the look of fine Italian craftsmanship thanks to the super-straight sheetmetal. And while many cars have chrome accents, this Caddy shows off some Italian flair with the red style line that hugs the entire perimeter of the car like an unbroken circle. Not only does the black roof look like formalwear on this white car, but when you fold it down you have an even more impressive black leather interior. There are two bucket seats that have been engineered to power adjust you and your passenger to the perfect comfort position. And modern R134a air conditioning means you two can stay comfortable with the top down well into the summer season. The whole interior is center around the driver. So all the controls for the power windows, power locks, AM/FM/CD/cassette stereo, information computer, and cruise control are all within easy reach. Plus, Cadillac was great at engineering an airbag steering wheel that still gives you a full view of the gauges. Thats especially nice because this one has the optional digital readout package. And because youll want to enjoy this grand touring Caddy for plenty of weekend trips, the trunk is large enough to handle luggage and the golf clubs together. Under the hood, the 4.5-liter V8 shows all signs of originality. This multi-port fuel-injection motor was designed to compete with the best in the world. In fact, Cadillac invested heavily in this car because they were out to be a better droptop than the Mercedes SL. So they made sure to hit their makes for powerful and luxurious. Thats why you have features like a four-speed automatic transmission w/overdrive, and a luxurious ride. And just like the Europeans, this Allante can hold the road with authority thanks to great driving components like four-wheel disc brakes, ABS, and a fully independent suspension. A nicely package and nicely preserved luxury droptop offered at an obtainable price. This Caddy is exactly what you want, and its ready for you to enjoy the long way home right now. Call today!! !